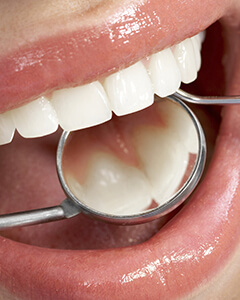 As periodontal disease progresses, we frequently recommend a combined therapy of increased hygiene visits, a deep cleaning known as scaling and root planing, and localized antibiotic therapy that removes plaque and tartar and prevents further buildup. Scaling is the systematic removal of plaque, tartar, and damaged tissue from the gums, and we generally recommend this treatment in conjunction with root planing, the smoothing of the tooth’s roots to prevent the future buildup of plaque and tartar. Bacteria excrete a sticky, acidic biofilm commonly referred to as plaque. While removing the plaque and tartar is beneficial, as long as bacteria continue to populate the area, more plaque will form. That’s why we often recommend topical antibiotic therapy in conjunction with any other gum disease treatments. These antibiotics are slowly released over time and minimize the amount of bacteria in the treated area preventing future buildup of plaque and tartar. We use Atridox and Arestin antibiotic treatments in our office. Contact Renu Dental right away if you experience any of the warning signs of periodontal disease. With early intervention, most patients are able to fully restore their oral health.